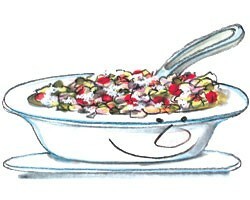 Combine beans, onion, cucumber, tomatoes, olives, capers, and Feta in a large serving dish. Toss gently to combine. In a separate bowl, whisk together dressing, lemon juice, garlic, garlic salt, and pepper. Drizzle over bean mixture and toss gently to coat well. Cover and refrigerate at least 2 hours to allow flavors to blend. Exchanges per serving: 1/2 starch, 1 1/2 vegetable, 1 fat. Carbohydrate choices: 1.